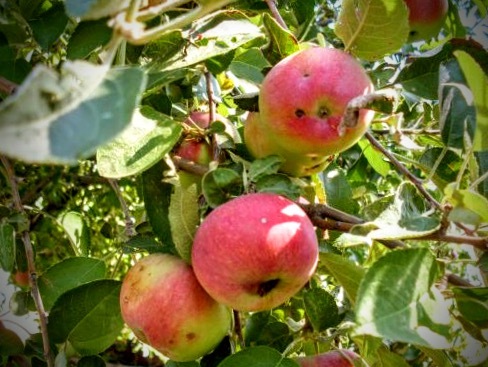 I look forward to gathering apples each September, when most of our local apples are ripe. We go as a family to a friend who has a beautifully kept yard, including three varieties of apple trees. The kids help us by picking up fallen ones, and keeping good plastic bags handy. When they have done all they can do, they get to play on our friends' trampoline, or the mini golf course, or pet the horses. Meanwhile, my friend and I ride up into the tree tops in a loader bucket, operated by her very handy husband, to reach all the apples we can. This needs dexterity and flexibility, and being on good terms with heights, but we usually spend as much time laughing at our failed efforts to reach apples as actually picking.This makes for a memorable afternoon. 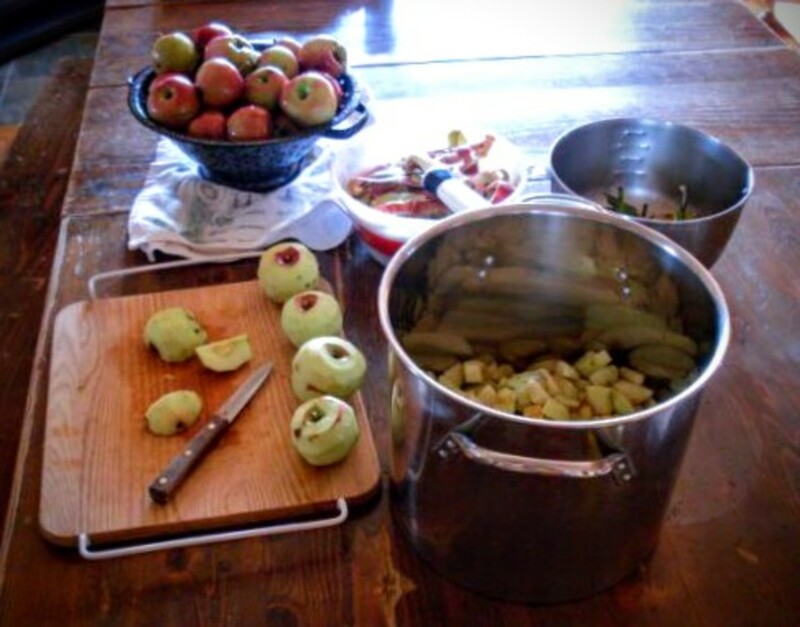 We keep as many of the best apples as we can for fresh eating (this variety lasts for a couple months or more in cold storage), and eventually dry, can, or pickle the rest. Our sheep and poultry get any that are too wormy or bruised to bother serving or processing. They adore them, and never complain about caterpillars! 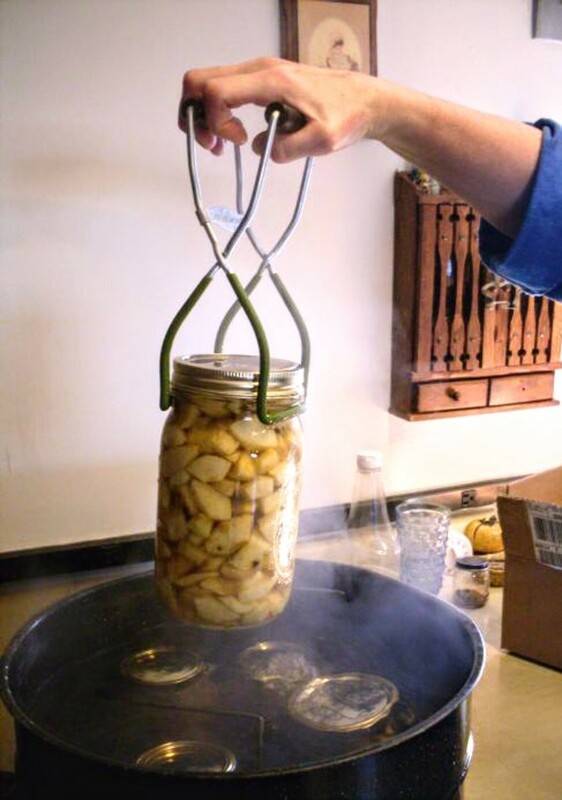 Below, I show you how we usually process apples for canning. These generally keep in the cellar for several years, if necessary - a good thing, as it isn't every year we get a great apple harvest! Unknown variety of sweet-tart apples, growing on a friend's property in northeastern Colorado. If you happen to be fortunate enough to have access to loads of apples, then do yourself a favor and put some up for winter pies. 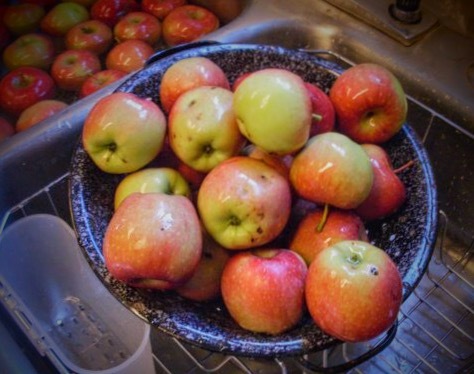 If you like to bake, you will be happy to know that you have a good supply of ready-to-use apples suitable for pies, cobblers, and nearly all other apple desserts. Was firm, fresh, tart apples to rid them of dust and leaves. 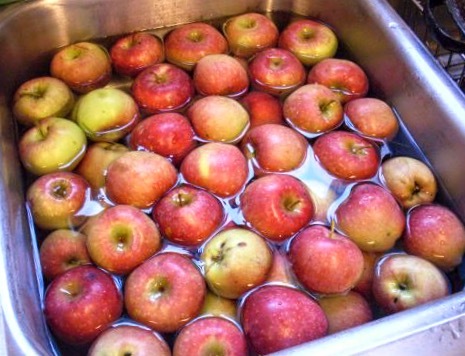 Drain them well before peeling and slicing, so they are not spattery and slippery. Peel (if desired) and quarter apples for easy slicing. Core them. You may also use a knife or coring gadget to core them beforehand...as long as they are not too wormy, which will mean frequent rinsing of your blades, and spreading of insect goo. 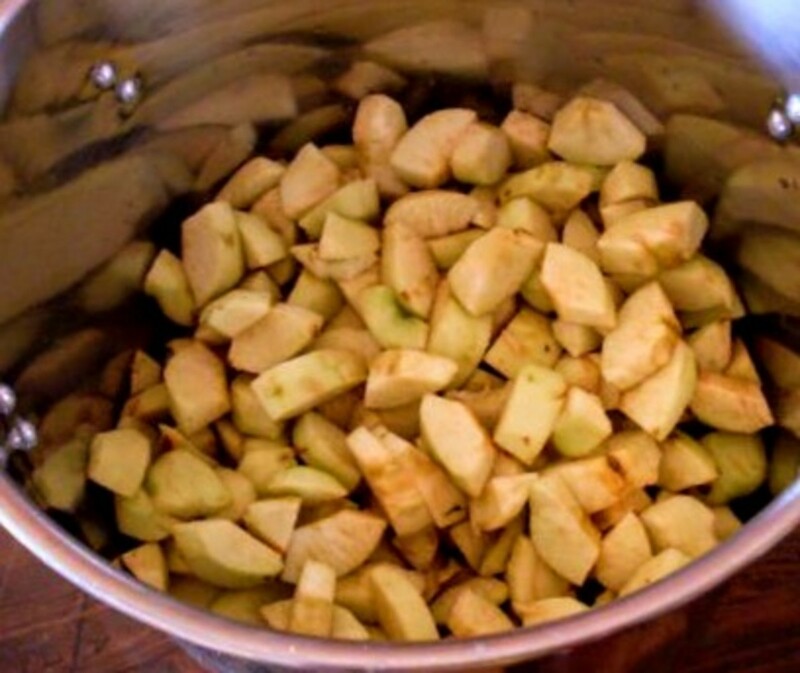 Slice apples into cooking pot. Cut any shape or style you desire, keeping in mind that smaller pieces will fall apart easier during the heat processing to come. 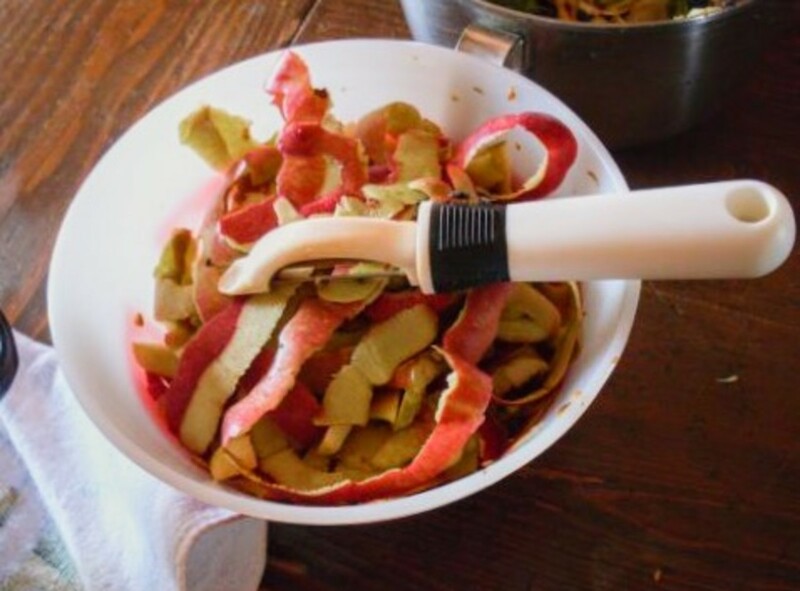 If making apple cider vinegar (more about that another time), save peels. Bag and refrigerate or freeze if you will not be using them right away. Meanwhile, check jars for nicks, cracks, and other problems. Do not use jars that are damaged. Wash in hot, soapy water. Scald if necessary (may use dish washer to clean and sterilize). Wash lids and rings. 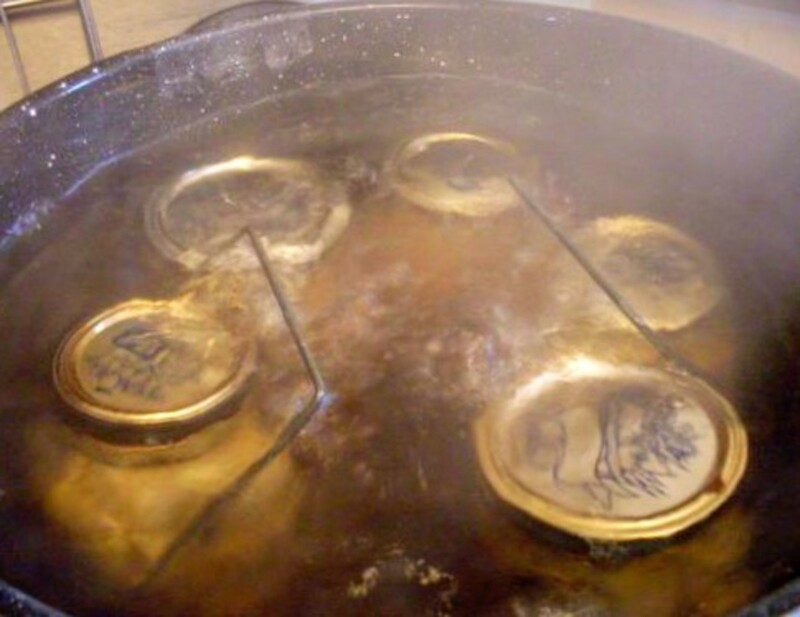 Set lids in a small pan and pour scalding water over them, or simmer them slowly in a saucepan of water. DO NOT BOIL! Leave them in the water until you use them, so they remain warm with softened rubber rings. 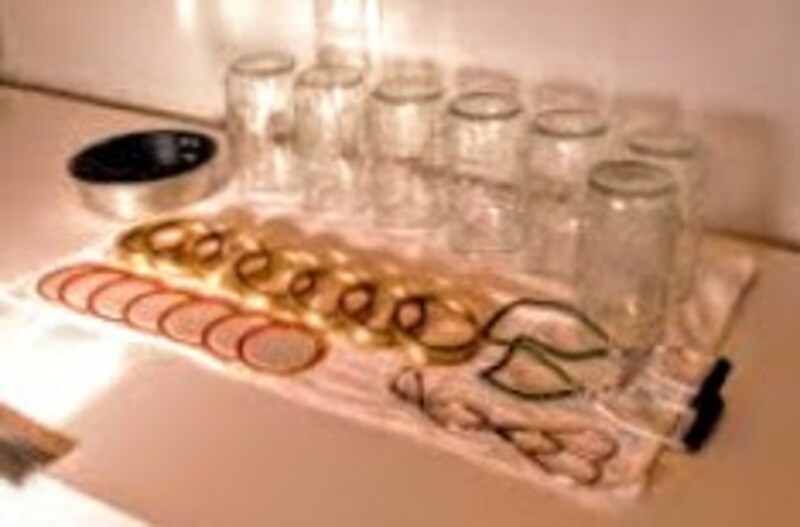 Adjust two-piece lids - snug, but not tight, and place jars in boiling waterbath canner rack. 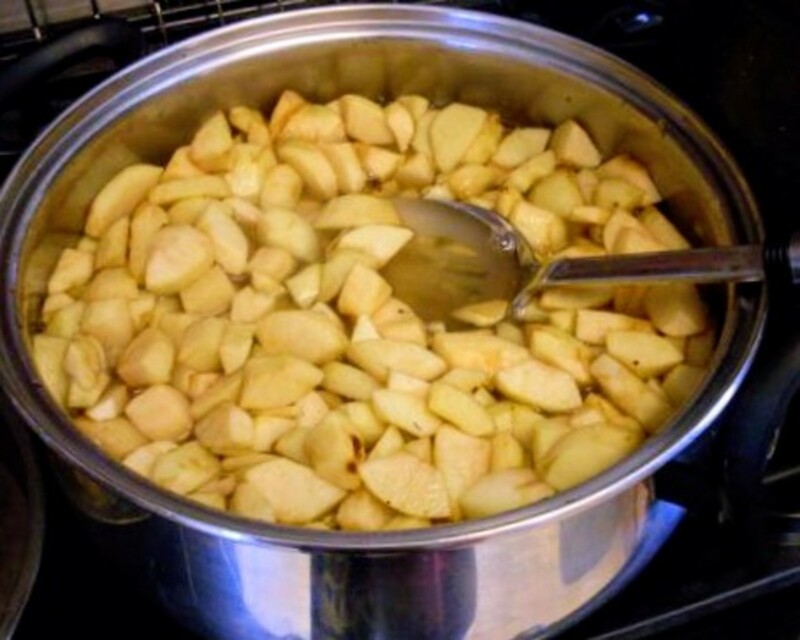 Prepare a sugar-water syrup of 1:3 (one part sugar to 3 parts water), enough to just cover apples. Cook 5 minutes, to shrink apples slightly. Place jars in boiling waterbath canner, with 1" of water to cover. Bring to a rolling boil, and process pints and quarts both for 20 minutes, so they get hot to their centers. Remove jars to a draft-free area on a board or towel to cool for 12 hours, or until thoroughly cool. Lids will "ping" and seal during this time. 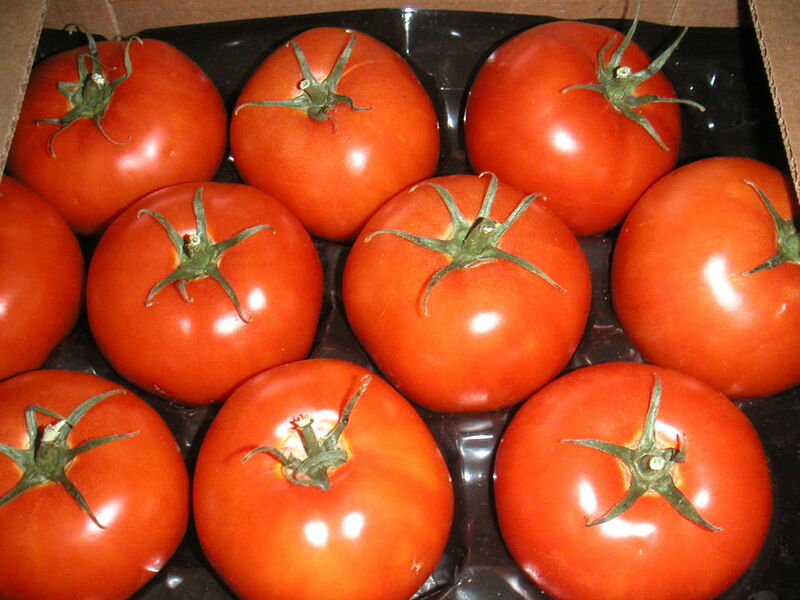 Refrigerate any that do not seal properly, and use within a couple weeks. Test lids for good seal (push on centers to see if they are sucked down properly), then wash jars to remove any stickiness from processing, and store in a cool, dark, preferably dry place. Mljdgulley, I am so glad everyone enjoyed the results of your excellent planning and superior baking! Mljdgulley, great memories, huh? And great food! Thank you for sharing this hub. I am so glad I came across it. 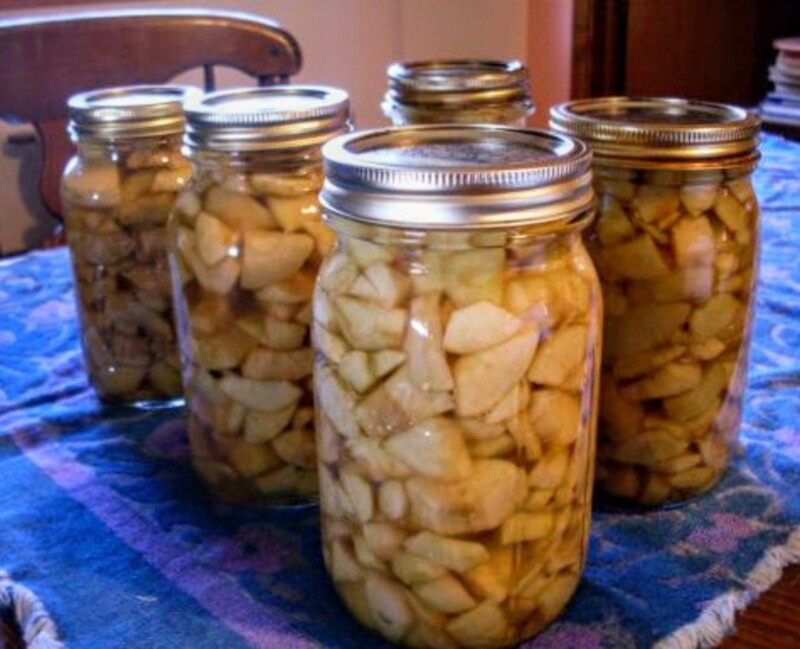 I enjoy home canning and this was an excellent tutorial for canning apples for apple pie. I did a lot of that kind of canning with my grandmother and children. Darla, I have made apple rings. They're fun for a change. We also enjoy the canned apples cold out of the fridge, as well as in baked goods. My Grandma used to can apples. She called them stewed apples. They were in a light syrup and sliced. She would put a jar in the frig and we would eat them cold. 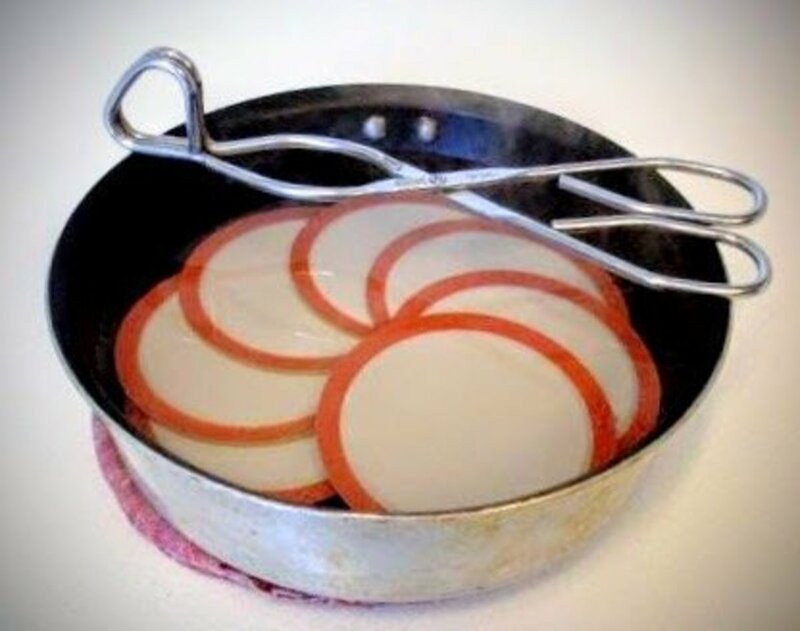 I also grew up with apple rings. You used to be able to get these at the store but I have not seen them for a long time. Great Hub! the photos are beautiful and explanatory. Thanks! Tlpoague, those sound like precious memories of working with your great-grandmother. That's a great idea about the cinnamon and sugar on dried apples. I usually leave my dried apple slices plain, as my kids are both sugar-sensitive, but that sounds fun for a change. Ivorwen, canning little apples whole is a great idea...as long as you're sure there aren't any creatures who have taken up residence inside the apples. One year, I had an infestation of earwigs and other insects, and had to spend time cutting all my tiny green apples, to check them. But it was worth it. You're right about the baked apples. Cold canned apples can be delicious. Home canned fruit--What a difference between this and the commercial products, especially, I think, when it comes to what are called pie fillings! I will stick with what is on my shelves, and be grateful for the chance to prepare our own food. Terrific hub and very useful. I love the idea of using pictures to explain the process. 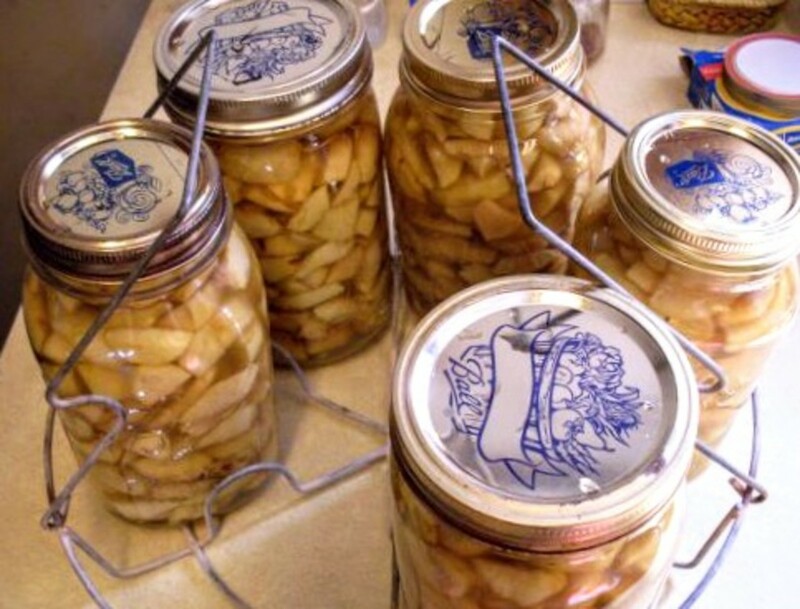 I miss canning and use to do quite a bit with my great-grandmother. I have to agree that sometimes drying the food is a better option. My kids love the apples I sprinkle with cinnamon and sugar and dry. Thanks for the post. This is a good idea. I like to can little apples whole, for eating with deserts in the winter. They come out tasting very much like cold baked apples. Aya, thank you! The apples in these pictures came from a friend, and were the best apples I have ever tasted. Alas, no one's fruit trees are doing particularly well this year, so there has been very little to share. Besides canning them different ways, we put up a great quantity of apples in boxes last year, stored in a cool place, for fresh eating, and those lasted a few months. I agree that eating processed foods can be a bad thing, so I try to keep it to a minimum, but our winters are sometimes eight months long, with snow on the ground from October through June. 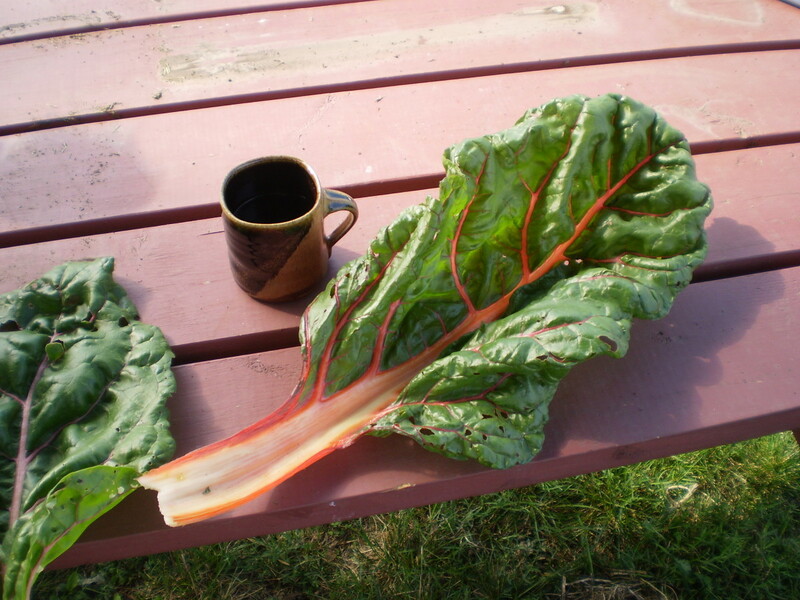 This doesn't leave much time for growing fresh food, without a hoop house or something similar, which I don't yet have. Our freezers are usually filled with meat, as we butcher for ourselves, and our dog is raw fed, so this is not much of an option for vegetables and fruits, either. 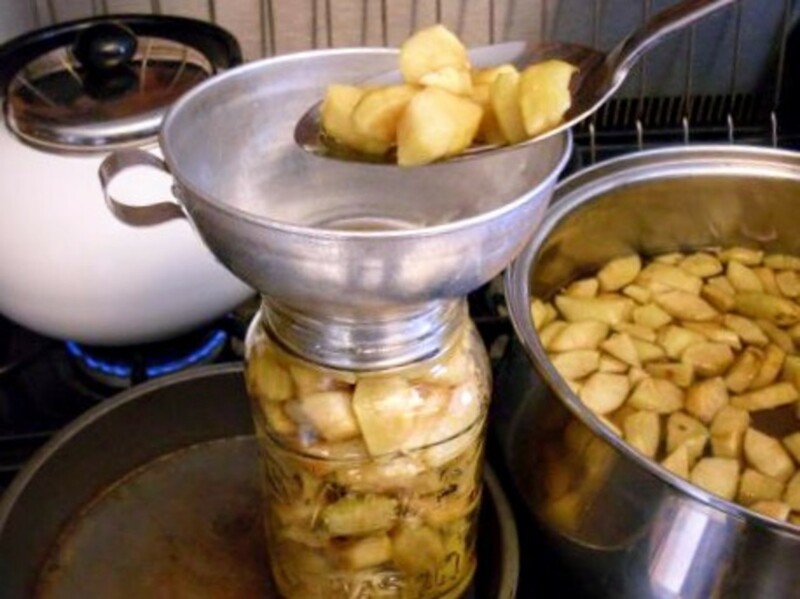 I dry many foods, besides canning, and am convinced this is a great option for some things. Great hub. I loved all the pictures. Some of our apples look like that first photo on the tree. They are not all perfectly round, and have all sorts of imperfections. Bow, my chimpanzee, sometimes has to be reassured that they are fine for eating, though they are not like store bought apples in appearance. I don't can our apples, though, because we like them fresh better. My daughter is not a big fan of apple pie or applesauce, and I myself worry about eating anything processed, even if processed at home. But you did make it look like lots of fun and very appetizing!